What? What does THAT mean, right? Well, as you know this blog was originally started to share Nia with the world. But as you also know, I don’t feel that I need to post about Nia and my Nia classes every post. I do feel I need to mention them in every post . . . . just to remind you about it! 🙂 So where am I going with this title and this post? Sigh. Confession time. Yes, forgive me readers for I am more-than-not-perfect and I want to share with you a habit I have. It is one of those habits that I don’t even know I am doing until I stop doing it and I sense the results of having done it. It is also an unhealthy habit (I am calling it that because in no way does it contribute to my health and well-being). I have been sitting at my computer for the last hour and a half — ha! No, that is not the unhealthy habit I am talking about! I have been doing some work. It is work that is taking a bit of concentration because I am searching for information. I was searching and trying to think of ways and places I can find what I am looking for. So I was concentrating really hard. When I decided to stop I realized my jaw muscles were sore. I stopped and thought about it and I realized I was probably clenching my jaw! I can’t recall if I was grinding my teeth or not, but I KNOW I had to have been clenching my jaw because it is very sore right now. Geez! So that is what I mean by there is no slack-jawed yokel here! Some of you might now know who THE slack-jawed yokel is. He is a character on the Simpsons. He is one of those people who you feel sorry for at the same time he annoys you because he is so not-smart. But my jaw is tense and not slack, yet I still thought of him. 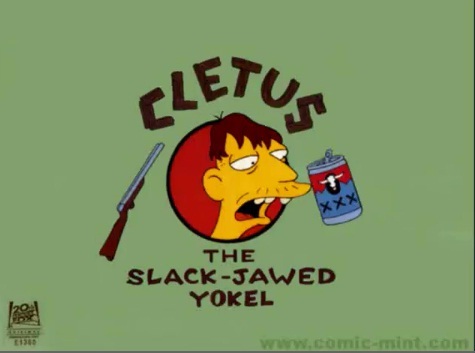 He is Cletus, the Slack-Jawed Yokel. You can click here for his theme song. As you know the title Yokel is not something to use for anyone . . . except maybe a made up character on a cartoon show. So please forgive me if you find this offensive, I do watch the Simpsons every once in a while and he is one of the characters and so his title popped into my head as I was trying to figure out why my jaw was so sore and tense. What about you? Do you find yourself clenching your jaw? Do you hold tension in your shoulders and/or neck? Do you have any suggestions to offer?